Broccoli is one of those veggies that doesn’t get enough love. It’s most often served sauteed in a stir-fry or steamed with gloppy cheese sauce or a squeeze of lemon. Boring (and gross). I do enjoy steamed broccoli with melted butter drizzled over the top and sprinkled with sea salt, and good thing, because the butter helps your body absorb the fat soluble vitamins and nutrients in vegetables. That’s right– you won’t absorb all the nutrients from broccoli or other veggies unless you eat the vegetables with fat. And for goodness sake, don’t eat broccoli raw–it can be very difficult to digest raw (read: gas and bloating), and it contains thyroid-suppressing goitrogens that are deactivated when cooked. 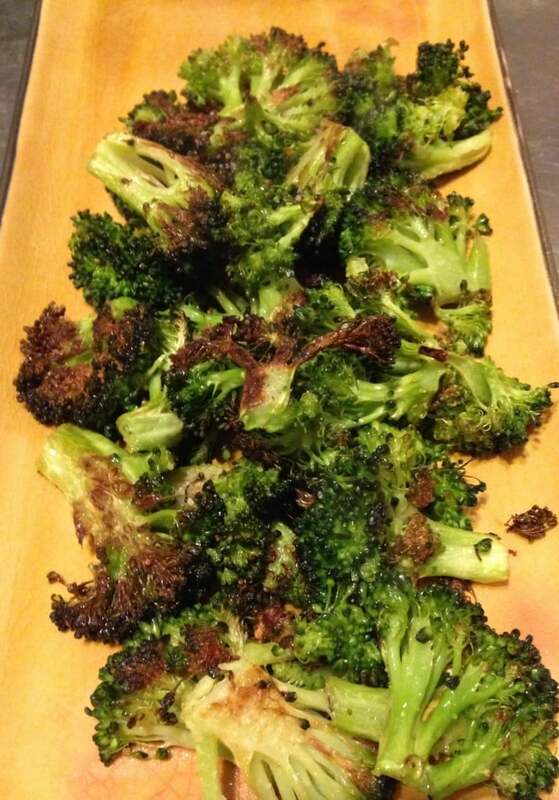 If you’re tired of the same ole ways to eat broccoli, try roasting it with olive oil. It is DELICIOUS. It gets all caramelized and has a nice buttery flavor. Great way to dress up a meal and try something different. Let’s look at some of the benefits broccoli provides. High in vitamins K & C– provides you with more than 150% of your daily C! Vitamin K is great for bone health. 1 cup of chopped broccoli is only 30 calories! Sea salt. I like Real Salt. Preheat oven to 375. Prep and chop broccoli and add slices to a large bowl. Toss with about 1/4 cup olive oil (depending on how much broccoli you’re making) and sprinkle with sea salt to taste. Toss to coat then spread in a single layer on a cookie sheet. Roast for 15 minutes, then flip and roast for about 10 more minutes. It’s done when it gets nicely browned on the edges but is still nice and green. Enjoy with your favorite meat dish!